Posted on 1, December 2017 by EuropaWire PR Editors | This entry was posted in Agriculture, Education, Netherlands, Science, Technology and tagged measure how ‘thirsty’ plants and crops, Radar technology in space, Tim van Emmerik, TU Delft. Bookmark the permalink. Delft, Netherlands, 01-Dec-2017 — /EuropaWire/ — Radar technology in space can be used to measure how ‘thirsty’ plants and crops are. This could play a key role in improving our understanding of how ecosystems and the water and carbon cycles interrelate. In theory, we have the technology to monitor crops on a global scale and identify where remedial action is needed. On Friday 1 December, Tim van Emmerik will be awarded his PhD at TU Delft for his work on the subject. With the surge in the growth of the smartphone industry, sensors have become much cheaper and more robust. Together with his colleague Rolf Hut, Van Emmerik therefore came up with the idea of using accelerometers as an affordable alternative for measuring tree movements over a longer period. By linking the speed of movement of a tree to other meteorological and hydrological data, he was able to relate the tree movements to external pressures (such as wind, evaporation and rainfall) and distinguish these from the physical characteristics of the tree itself (such as elasticity, mass and water content). Van Emmerik investigated all of this step-by-step in tomato plants, in corn fields and in Brazil. 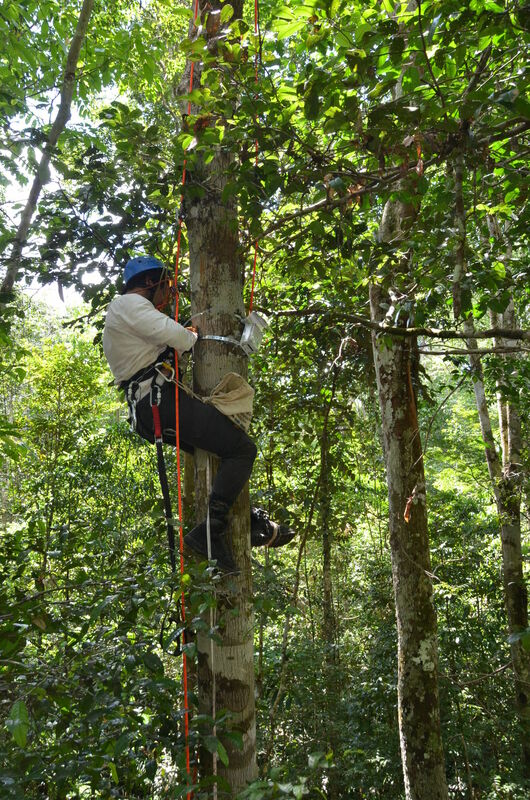 In order to investigate the impact of water stress in tropical rainforests, accelerometers were installed on 19 trees in the Brazilian Amazon to measure their movement. The way in which trees move depends on various characteristics. Van Emmerik shows that the movement is affected by the tree mass, the amount of water that remains on the leaf canopy and how much the tree interacts with the atmosphere. The data also revealed a clear difference between the rainy and dry seasons.